RECRUIT YOURSELF NOW! JOIN THE STRIKE FOR PEACE! 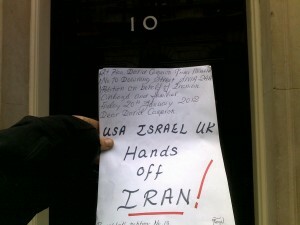 January 27, 2012, filed under On Strike for Peace, vigil for Iran; 1 Comment. 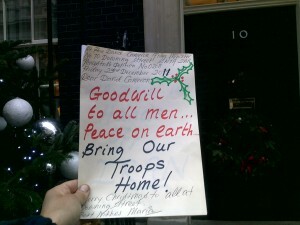 Make a conscious decision to go “ON STRIKE FOR PEACE” should hostilities against IRAN / SYRIA become dangerously close…. We will have nothing more to lose, but everything to gain! 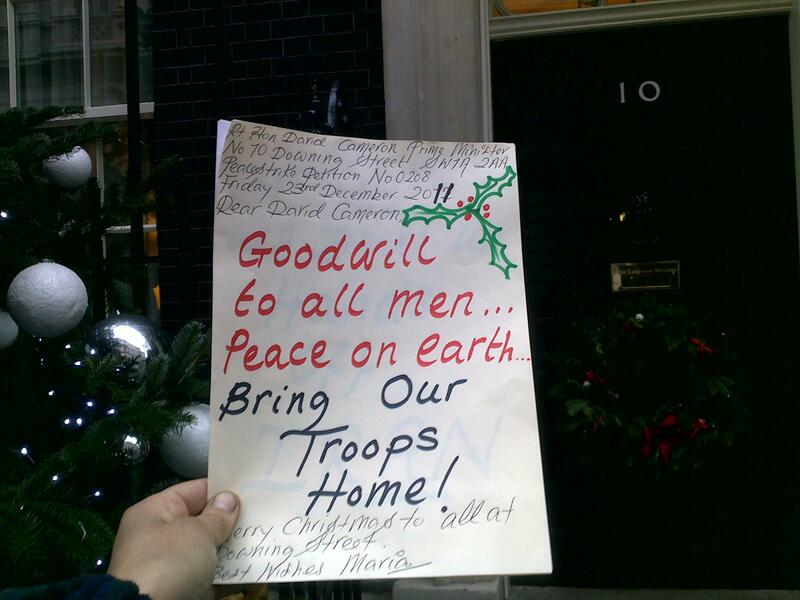 We will not allow another repeat of IRAQ / Afghanistan……..
It’s up to us, the Grass Roots Movement to lead the way. “DO NOTHING” and “BUY NOTHING” for peace. Make the pledge to save life. More info regarding this will be posted shortly…..
Join the Peace Strike demo this Wednesday 1st February, Opposite Foreign Office Whitehall 4 – 6pm. “PEACE FOR IRAN – NO TO WAR!! 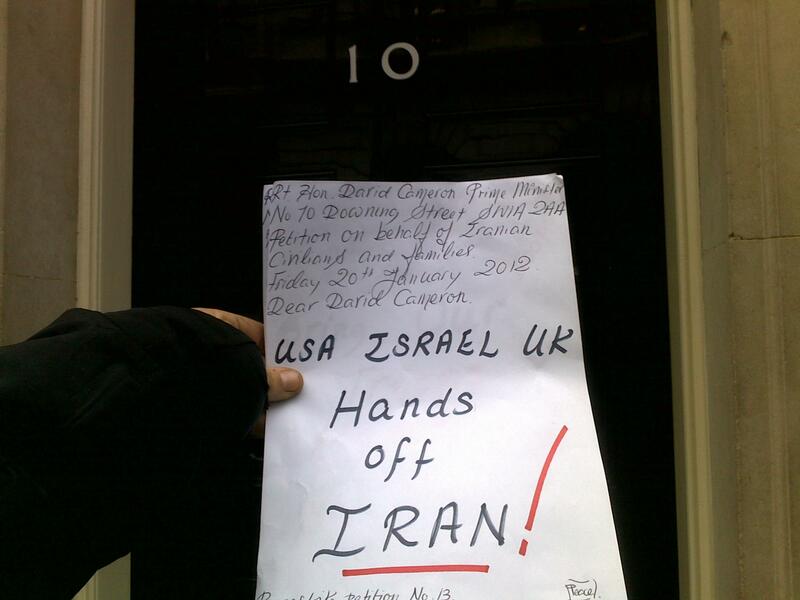 January 20, 2012, filed under vigil for Iran; 2 Comments. Bring Banners, whistles enthusiasm and energy! This is the start of the BIG PEACE OFFENSIVE to prevent a war with Iran. We are organising protests to highlight the great concerns held internationally, that a war on Iran will affect everyone. We will not be party to the intended destruction of any nation. We are peaceful people and have a duty to promote peace for everyone, everywhere. Bombing countries is not a solution to anything, it will only escalate retaliation. We will not standby and see a repeat of what happened in Iraq and Afghanistan. Too many people have died and been seriously injured due to lies and deceit. March 26, 2010, filed under vigil for Iran; 1 Comment. It is authorized under the SOCPA 2005 legislation concerning demonstrations in and around the Houses of Parliament. The Vigil is authorized for up to 20,000 people and started on 1st September 2009. We welcome all peaceful people who want to share their concern in they escalating threat of a pre-emptive strike on Iran. The political situation in Iran and in the wider International arena is complex. We at Peacestrike advocate peaceful negotiations aimed at preventing another war in the Middle East. Any Pre-emptive Strike against a Sovereign Nation is seen as an ‘Act of Aggression’ in International Law and is morally injust and therefore unacceptable. Any expansion of the war now into Iran will destabalise the world and mean decades of death and destruction for all concerned, not to mention the Iranians themselves. Do we really want to live in a militarized world? Do we want our children growing up ready to be mobalised for war? We think not, and and therefore, our stand is to say ‘NO’ to any form of oppression or threat towards Iran and the Iranian people. It is important NOW to build-up a regular Vigil outside the Houses of Parliament in order to show our justifiable concerns. Remember it is our RIGHT to demonstrate and to be seen and heard. We live in a free and democratic country so therefore, BECAUSE WE CAN….WE MUST! We can only prevent another war from happening if we act now BEFORE any possible attack. Come and join us now, all welcome!